During the campus recruitment drive held at Geetanjali Institute of Technical Studies, Dabok GE Healthcare selected 01 B.Tech and 01 MBA students for Management Trainee Profile. Student will have got stipend of Rs 20000 for MBA student and Rs 15000 for B.Tech during training period. The Training and placement head Mr. Arvind Singh Pemawat of organization informed that GE Healthcare offers financial & administrative, clinical and service IT solutions that serve a broad range of organizations from small physician practices to large hospital systems. Company officials Mr. Amish Agarwal (Business Manager) and Ms. Radhika Bhatiya (HR GE Healthcare) brief about the Company profile and their job profile through power point presentation. Ayush Tailor from B.Tech EE and Vibha Purohit from MBA were selected as a Management Trainee Profile after a round of Group Discussion, Personal interview and HR Interview. 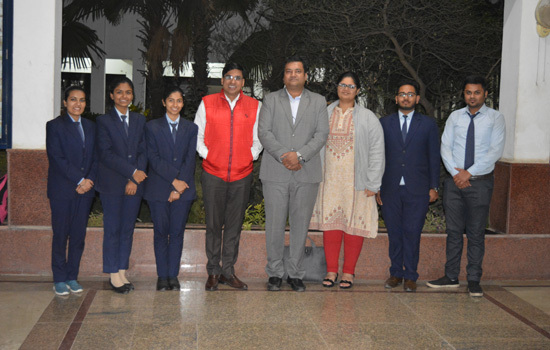 GITS Director Prof Dr. Vikas Misra and Finance Controller B.L Jangir congratulate the selected Students and advised that they do their work with full efficiency for their better future.